Last night on Mix 107.7, the North Lamar Pantherettes remained undefeated with a 9–3 victory over Pleasant Grove In Texarkana. Freshman Sloane Hill finished with two hits and four RBIs in the win. Karsyn Iltis also had two RBIs for NL. The Pantherettes will host Paris Friday night. Tonight in softball, Chisum will host Mt Vernon. 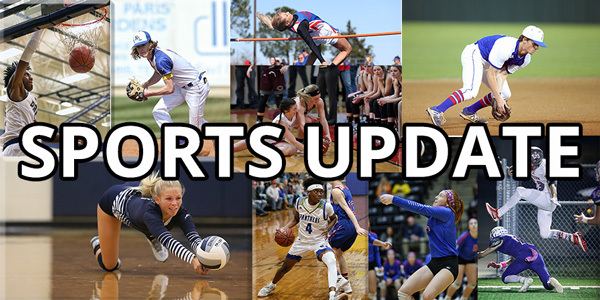 In baseball, North Lamar hosts Liberty Eylau, Paris will be home against Pittsburg, Prairiland travels to Commerce while Chisum is at Chapel Hill. In the Area round soccer tonight, the Paris girls will play Mabank at 6″00 pm. The Paris boys will play Athens at 8:00 pm. Both games will be at Sulphur Springs. The North Lamar girls will play Athens in Grand Saline at 7:00 pm. The Mt Pleasant Lady Tiger Soccer playoff game vs. Red Oak has been scheduled for tonight at T.A. Cotton Ford Stadium in Greenville, at 6:30 pm. The Mt Pleasant boys team also plays tonight, as they will face Joshua at 7:30 pm at Rockwell. Brad Peacock allowed two hits while pitching into the seventh inning, Robinson Chirinos looped a go-ahead double in his first game against his former team and the Houston Astros beat the Texas Rangers 2-1 on Monday night. Game 2 of the series is tonight at 7:05 pm. It will be Miller vs Verlander on the hill. The Dallas Mavericks rolled to an easy win last night over Philadelphia 122–102. Justin Jackson led Dallas with 24 points. The Final 2 pieces of the Women’s Final Four was solved last night as Baylor rolled Iowa 85-53, and Notre Dame came back in the 2nd half to beat Stanford 84-68. So, it will be Baylor vs Oregon Friday night at 6:00 pm and the Fighting Irish will take on UCONN at 8:00 pm. The University of North Carolina announced Monday that its women’s basketball coaching staff is being placed on paid leave while the program is reviewed due to “issues raised by student-athletes and others.” The Charlotte-based firm Parker Poe Adams & Bernstein will conduct the review and assess the culture of the women’s basketball program and the experience of our student-athletes. Kentucky has offered basketball coach John Calipari a lifetime contract. The deal would be a combination of a head coaching extension and a paid role as an ambassador following his retirement. Calipari had been in contact with UCLA about the school’s open head coaching position and had been offered $48-million over six years. Calipari, whose current contract at Kentucky runs through 2024, is the highest-paid basketball coach in the country, with total compensation of $9.2-million this year. He also receives a reported retention bonus of $2.6-million in each of the next three Julys.